Pension documents belonging to Thomas P. "Boston" Corbett, the man who killed John Wilkes Booth following President Lincoln's assassination. Corbett moved to Kansas in 1878 and lived in a dugout near Concordia, Kansas. In 1887, Corbett was given the position of assistant doorkeeper for the Kansas House of Representatives in Topeka. However, when he brandished his pistol during a session of the legislative that same year, he was arrested and sent to an insane asylum. In 1888, he escaped and his whereabouts remained unknown until his presumed death. 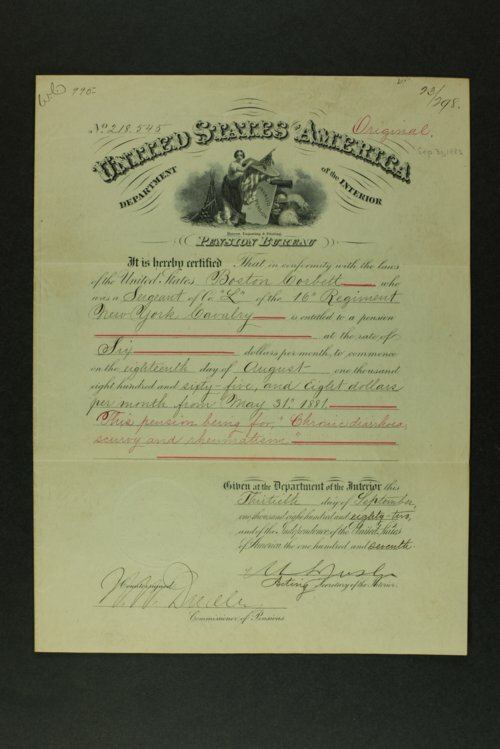 The pension certificate, dated September 30, 1882, cited "chronic diarrhea, scurvy, and rheumatism" as the reason for his disability which he contracted while imprisoned during the Civil War.